Welcome to Laser Tag Advisor! Laser Tag Advisor is our site committed to presenting you with the best information and resources about laser tag guns, accessories and game play. If you’re new to or curious about Laser Tag, we hope to convince you of the merits of this great game and hope our love of the game comes through in our articles. For you experienced players, we hope you’ll enjoy our numerous variations on the game and try to incorporate some of them in your next Laser Tag session. Laser tag is one of our favorite outlets for family fun. It’s been able to help teach our children about teamwork, diplomacy, decision making, strategy and practical math skills in a super fun and physically active way. 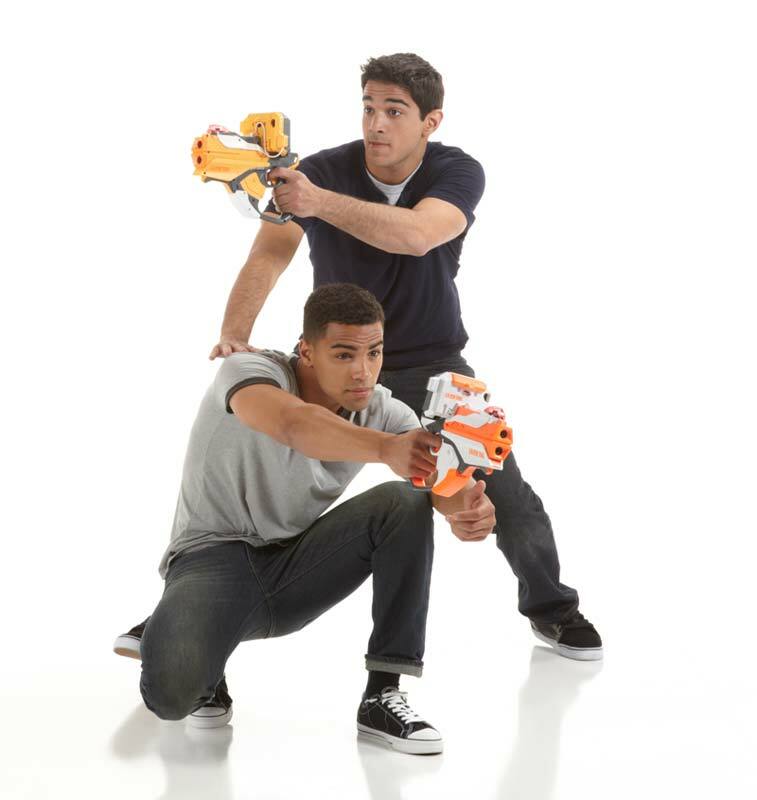 Check out our articles about laser tag guns (aka taggers), accessories, game play and more. Click on our recommended order of posts to get started. The resurgence of Laser Tag is in full effect. And it’s really no surprise. First of all, conscientious parents are desperately trying to get their kids off their screens and running around and playing again. Second, it scratches that competitive itch with minimal chance of injury. And third and most importantly, it’s a whole lot of fun! Both have their plus and minuses. I prefer option 2 because it allows room for creativity and flexibility. That said, Option 2 does require you to purchase your own equipment, which for most options, won’t break the bank. And if you play often enough, buying your own equipment will reduce your cost per play to pocket change. With all of the available choices in the market, we’ve come up with our 3 favorite taggers for home use. Ok, I’ll say it. No list of “Best Laser Tag Equipment for Home Use” would be legit without The Phoenix. These taggers have some weight to them (about 3 pounds). There are a ton of cool features that make you feel like you’re not only in a gun fight, but in a video game, as well: cool laser sounds, female computer voice, recoil, reload, vibrations, life and ammo meters. What I like best about these taggers is they’re really easy to use, which is important when playing Laser Tag with kids. If you’re new to Laser Tag, The Phoenix LTX is the way to go. They’re very affordable. And they made this grown man love toys again. To check out my full review, click here. Or you can see what others are saying about The Phoenix LTX on Amazon. The Kidzlane taggers (KTs, for short) come with a bunch of features not included with the Phoenix taggers, that I’m pretty ho-hum about, but you may find to your liking. Two of the main ones include different weapon settings eg Pistol, Shotgun, Submachine Gun and Rocket, and the ability to play up to 4 teams. They also use 2 less batteries than the Phoenix, which is a small plus. And since they come in a set of 4, all you need is 2 sets of these bad boys and you’ve got yourself a party. Like the Phoenix, these taggers are very sturdy and easy to use. The range on them is about 120 feet, which is considerably less than the Phoenix. And the smaller life meter combined with the additional damage some gun settings can inflict, make for much shorter games. But I’ll tell you what..Kids love them! And you can’t argue with that. If the primary users of the taggers will be younger children, I highly recommend the KTs. I’ve seen kids running around non-stop for hours having a blast with these things. Not that adults can’t have fun with these as well, as numerous Amazon reviews can attest to. But in my opinion, these taggers are best suited for kids 6 to 11. Ok, I may have a soft spot for these since they were the first taggers I’d ever seen or used. 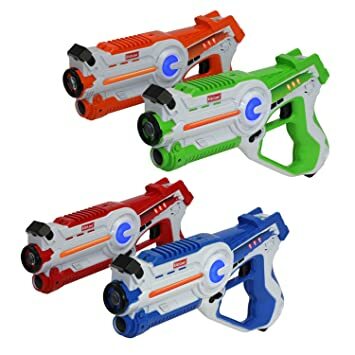 And to be perfectly honest, I don’t think these would make most Laser Tag enthusiasts’ Top 3 lists. But hear me out for a sec..
Let me start out, these taggers are for young kids, ages 5 to 9. If that’s not the primary group who you’re thinking of purchasing taggers for, read no further. These taggers are as simple as they get. You get the basic bloops, bleeps, and vibrations when tagging or being tagged. Each package comes with a green laser and a red one. If you buy multiple sets, all of the green lasers need to be on one team, and all the red ones need to be on the other team. Each require 3 AAA batteries, which is the fewest required by any tagger that I’m aware of. The tagging range is about 40 to 50 feet, so games are best played in a backyard or small park area. No multiple weapons options. No sights for aiming…just point and shoot. So because they’re so simple, they don’t cost as much as other taggers…and so you can buy a whole bunch of these and have yourself a grand ol’ time without worrying too much about damaging a somewhat expensive toy. The other big plus, from the point of view of a parent, is that they don’t look anything like real guns. More like futuristic space-aged phasers, you might see on a sci-fi drama. Lemme tell you, these are absolutely perfect for kids parties. No need for an expensive clown or other form of entertainment. All you need is a bunch of these taggers and some participation/merit prizes and you’re all set. At the end of the day, you’re gonna end up with a bunch of tired, sweaty happy kids who will be talking your ear off about all the cool battles they had that day. You can check them out on Amazon right here. So there you have it, our choices for Top 3 picks best Laser Tag equipment for home use. Each has its pluses and minuses, as well as intended age group. This is by no means an exhaustive list on the best Laser Tag sets. I would say I’ve had experience with about half of the taggers on the market. Below is a list of taggers that I personally have had no experience with, but have heard great things about. When I do get a chance to check them out, you can be sure I’ll give you my two cents as soon as possible. Once you’ve got your taggers picked out and ready to go, make sure to check out our Laser Tag Game variations section to get ideas on how best to throw a Laser Tag party. *These last two options are supposedly the gold standard when it comes to taggers. Unless you’ve got money to burn, I would not recommend purchasing these at their current prices. If you’re really interested in these, I would check Amazon periodically, because prices do fluctuate. Or check out your local craigslist. You could get very lucky.